How a spiritual expat from the “Christ-haunted South” found healing through art and Eastern Orthodoxy. Growing up in Jackson, Mississippi, in the 1950s and ’60s, I was always attracted to powerful religious experiences. From my childhood years in the Presbyterian Church, through my involvement with religious movements on college campuses, and finally the Jesus freak hippies that formed a church in my first apartment, I finally landed within the walls of the ancient Orthodox Christian Church in the 1980s. It is no small thing to leave one’s religious upbringing, especially in the South, for something as foreign as Easter Orthodoxy. With this conversion came lots of changes, and the process continues today. First I changed my name. I chose Mary of Egypt as my patron saint early in my conversion, changing my name from Susan to “Marye,” and adding the “e” for Egypt, a way of distinguishing her from Mary the Mother of God and other saints who shared her name. I began signing all my correspondence, “forgive me, Marye, the sinner,” and naively used “sinfulmarye” as part of my original email address. You can imagine the spam that hit my in-box. My husband had become a priest in the Antiochian Orthodox Church, and so, to add to the peculiarity of my new nomenclature, I started using the church’s traditional title for a priest’s wife – Khouriya – introducing myself in church circles and taking communion as Knouriya Marye. Then I started covering my head in church. 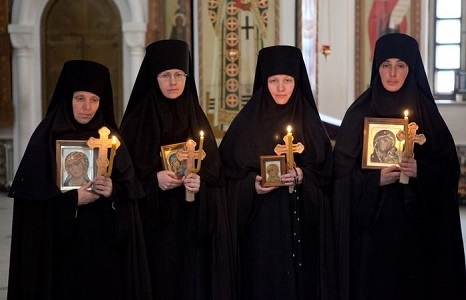 While head coverings are common in countries where Orthodoxy is indigenous, they’re rare in America, especially in the South, even in our Orthodox churches. But the custom was cropping up in some convert parishes, and soon a half-dozen or so women at Memphis’s Saint John Orthodox Church were covering their heads during worship. I’m sure my close friends and family were wondering where it would all lead. And then I met the nuns. Everything about Holy Dormition Monastery reflected a high level of care and attention to detail. The grounds were meticulously maintained, mostly by the nuns themselves, with some help from visitors. On one of my visits I asked if I could help clean the chapel. The nun assigned to the task showed me how to clean the iconostasis, the icons themselves, and some of the altarware used during services. We cleaned the windows, dusted the chairs, and lifted the oriental rugs to clean underneath them before laying them flat and vacuuming them, with special attention to straightening out the fringe on the ends. “So, how often do you do such a thorough cleaning in here?” I asked, thinking this must have been a spring cleaning of sorts. The nuns didn’t wait for the house of the Lord to get dirty before cleaning it. They kept it clean always, the way we should care for our souls. The same nuns who had been busy cleaning and gardening and cooking and sewing vestments and painting icons and welcoming visitors during the day quickly found their way into the chapel at the sound of the wooden hammer rhythmically beating on the semantron – the gong-like instrument that called us to prayer – and the ringing of the bells before the evening service. When I entered the darkened nave, my eyes adjusted slowly to the candlelight, and my other senses came alive. All around was the sweet pungency of incense. As I took in the shimmering gold leaf of the icons, I realized the nuns were singing, beautiful Romanian melodies whose words I couldn’t understand but whose sense I somehow felt. After asking a blessing from the abbess, the nuns took turns at the reader’s stand. The ones who weren’t chanting often prostrated themselves, rolling gracefully into little black balls on their knees for long periods of time, their faces to the floor. I fell in love with Mother the first time I met her. This beautiful Romanian nun was about my age, and we had both married when we were only nineteen. But she married Jesus. Thirty years later she found herself serving as abbess of an active monastery that kept the traditional schedule of more than six hours of church services daily, while welcoming Orthodox clergy and hierarchs on a regular basis, serving dinner for up to a hundred guests most Sundays, maintaining a cemetery, a vegetable garden, a vestment-sewing business, an icon studio, and caring for visitors in its guest house year-round. In the midst of this busy schedule, Mother always took time to meet with her spiritual children from the outside world. She took me on; and, as I became a student of iconography in the monastery’s classes taught by Russian iconographers, Mother Gabriella’s guidance never wavered. Iconography is spiritual work. It involves adherence to ancient canons regarding style, content, and even the choice of colors for the various subjects illustrated. After my first three workshops, I became frustrated with the harshness of the Russian instructors, so with Mother’s blessing I traveled to numerous other places to study under iconographers from Greece and the United States. Eventually, I found my way back to the monastery to take a class under one of the Romanian nuns. For the next few years I explored a variety of these styles, always using egg tempera and gold leaf. I painted dozens of icons over the next several years, and even began doing commissioned pieces, giving lectures on iconography, leading workshops at my church, and teaching classes in my studio at home. Iconography opened the door for me to find my way back to art – especially to writing. Or maybe I should say it was a way for me to come in the back door to art. As a spiritual discipline, it was looked upon favorably by the church and, more importantly, by my pastor and my husband, both of whom I still desperately wanted to please. It would be a few more years before I would take the next step towards self-realization as an artist. But first, I had more work to do on my wounded psyche. It was the last day of my pilgrimage, and Mother had asked me to wait for her after lunch, on a bench under a tree that overlooked the vegetable garden. I always anticipated these talks with a mixture of anxiety and hope, as one might feel before a surgical procedure that held potential for great healing. I sat on the bench, admiring the beauty of the sloping grounds, surrounded by deep woods which formed a protective border around the back of the monastery property. This was Michigan, and the pleasant breeze held none of the stifling heat of summer in the South. The Mother of God flower garden was in full bloom, and the vegetable garden was at its peak. As I waited for Mother to join me, I thought about what I would say to her this time. . . which struggles I would place in the light of her compassionate wisdom. She knew me well, having been my guide through various stages of my (ongoing) recovery from sexual abuse, eating disorders, and various addictive behaviors. She was always a safe place for me to land with my anger, especially when it was directed at the church and its hierarchy. Yes, this spiritual home that I had found after my seventeen-year journey wasn’t perfect. It was filled with broken people, just like me. But my experiences growing up with abuse and not finding safety even within the walls of the church had left me in a messy and continuing battle with forgiveness. Just as I was forming these thoughts for my talk with Mother, I noticed one of the nuns pulling weeds in the garden. This struck me as odd, because I knew they were excused from physical labor on Sundays, other than the necessary tasks of preparing meals and cleaning rooms in the guest house for incoming visitors. Bent over in her long black habit which covered every inch of her skin other than her face and hands, the nun labored meticulously, her works – and her very identity – hidden from the world’s view. It was only when she turned and began walking up the hill toward the bench where I was sitting that I recognized her. Yes, the abbess of the monastery was pulling weeds in the vegetable garden. She approached me with a smile and sat beside me under the shade tree, placing the weeds on the ground at her feet to take care of later. I think she would have sat there silently for a long while if I hadn’t hurried the conversation. The day before I had seen an elderly nun driving a tractor, hauling broken tree limbs and other debris to the back of the property. I felt so bad for her that I offered to help, but after an hour or two, I was worn out and returned to the guest house to rest up for the evening’s four-hour church service. But the old nun kept working right up until the bell rang for Vigil, when she climbed down from the tractor and headed into the chapel and approached the reader’s stand for her shift as chanter. “What’s that?” Mother asked, pointing to the book in my lap that I had discovered in the monastery bookstore earlier in the week. Mather was silent for a minute before speaking. She often did this, pausing to finger the knots in her prayer rope. Mother had watched my spiritual metamorphosis from “Khouriya Marye” with my monastic yearnings for several years, back to “Susan,” as I reclaimed my given name and focused my energies on finding balance. After about five years of what some of my friends called my “nun phase,” I took off my head covering and embraced my Southern roots. Manicures, make-up, and jewelry returned to my arsenal, and my long-neglected hair again received layered haircuts and blond highlights. The “new me” wasn’t as glamorous as some of my Arab-American girlfriends, but I was making a move towards the center, and it began to feel good. One of the talks I gave at the retreat was titled, “Women Saints Who Found the Middle Way.” Instead of recounting stories from the lives of saints who had lived in extreme poverty or who had experienced brutal martyrdoms while trying the everyday business of getting meals for their families, caring for the sick, and burying the dead. Rather than sharing the amazing but bizarre life of my own patron, Saint Mary of Egypt, I chose to speak of Saint Julianna the Merciful and Salome the Myrrhbearer, encouraging my listeners to find joy in living more conventional lives. So there I stood with this group of Orthodox women beside a river on a beautiful ranch just outside Austin, trying to keep my feet firmly planted. As I returned to Memphis, refreshed by my encounters with my new friends in Texas, I found another group of women waiting to guide the next steps of my journey. As I listened to King and the other women on the panel for All Out of Faith, my heart was beating so loudly in my chest that I was afraid everyone in the room could hear it. On the inside flap of the book’s cover, I read these words: “The South is often considered patriarchal, but as these writers show, Southern culture has always reserved a special place for strong women of passion.” That’s me, I thought. And in the Afterword, the book’s editors, Jennifer Horne and Wendy Reed, wrote about how “spirituality is not removed from ordinary life but infuses it,” and about the need to “go inside myself, below the roles I’d taken on as layers.” Yes. During the festival I also met Lee Smith, who was reading from her latest work, On Agate Hill, and the poet Beth Ann Fennelly, who paints a vivid picture of her own take on womanhood and spirituality in her poetry. She was reading from her latest book of poems, Tender Hooks. My favorite poem in that book is “Waiting for the Heart to Moderate,” in which she describes what it feels like to be “all edges, on tender hooks” at every stage of a woman’s life and to still feel the music “booming in her breastbone.” I’m much older than Beth Ann, but I still hear that music, and like her, in my own efforts “to free it,” I also worry that I “might do something stupid.” But maybe my middle-aged heart is finally learning to moderate. Or maybe a perfectly crafted book. Three short months after my encounter with these strong women of faith, I completed a novel. But it was a thinly veiled attempt at hiding my truth in the lives of the fictional characters I invented. And since I had an agenda, the characters weren’t free to chase the creative rabbit trails they longed to pursue. So I laid them gently on a shelf (to be resurrected later) and I began to write my stories and submit them to literary journals and magazines. In just over a year I had seven personal essays published, so I strapped on my courage and began the work that had begged for an audience from the beginning – a memoir. A year later I realized I wasn’t ready to go public with all aspects of my history, so I abandoned the memoir and returned to fiction. My current novel-in-progress features three strong women of passion as its protagonists. I don’t know if the writing of it will be my salvation, but it is, at a minimum, an effort towards wholeness. Learning to serve the gift through writing and painting is bringing wondrous newness into my life every day. Once it surfaced in an essay about how anger blocked me from painting icons, and how the beach, a dream, and a soft-rock pop song helped me get unblocked. At other times that newness has shown up to cheer me on as I embrace the darker aspects of my Mississippi childhood by laying down difficult chapters of my novel-in-progress. Sometimes I feel its presence during the sacrament of confession, when I’ve been up all night facing down my demons as I write, often chasing them with vodka or wine. Maybe my brokenness, like the egg yolks that I use to make tempera paint for my icons – themselves a form of life interrupted – is part of my offering to God.